The third installment of the Story Thieves series had me puzzled at its conclusion. If this was a trilogy, why weren’t all the plot points neatly wrapped up on the final pages? I must have missed the memo because this is destined to be a five book series. Thank goodness. If you are new to Story Thieves, don’t begin here. You’ll be totally confused—well, enough that you won’t enjoy it as much. Start from the beginning with STORY THIEVES, a grand adventure. Next move into STORY THIEVES—THE STOLEN CHAPTERS, a wildly imaginative mystery. Only then should you delve into STOLEN CHAPTER—SECRET ORIGINS, set in the comic book world. Yes, the mystery and adventure threads continue here with Owen and Bethany in search of her father. You’ll find the same level of humor and snappy dialog. There are even a few comic book panels thrown in. Great for avid readers or as a read-aloud, its just hard to resist the creativity that went into the building of this tale. FULL PLOT (From Amazon): Owen and Bethany have sworn off jumping into books for good. But they didn’t make any promises about not jumping through strange portals that lead to a comic book world. You’ll either groan at The Rotten Banana character or enjoy his side splitting one-liners. He has a bruised past, making him either a super hero or a less appealing villain. The puns are his only slip-up so be warned. The twist in this series has always been the division between the fiction and non-fiction worlds. It’s a marvelous play on your thoughts as a reader or writer. No worries if you aren’t a comic book fan. There’s enough going on in the heads of the main characters to keep you reading. The Dark makes for a fantastic antagonist. He’s protected by shadows to add to his mysterious creepiness. Strong main and secondary characters. Their personalities shine through with every dialog exchange. The cover is also one of my favorites. 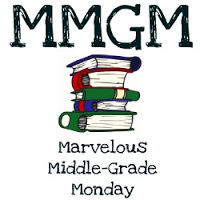 This entry was posted in Reviews and tagged James Riley, Marvelous Middle Grade Monday, MG book reviews, Middle grade, Story Thieves. Bookmark the permalink. Glad there were more books in the series for you. Thanks for the heads up to start with book one. It must be good if you are reading book #4. I started reading this story and had a hard time with book 1. Still on my shelves. I tend to set aside books I have trouble getting into, with the thought I need to stick to my themes — but will get back to it. So you’ve inspired me. Thanks! This is one of those series kids enjoy more than adults. It’s quirky and breaks many traditional writing rules. Not sure I will read #4 as it is a Choose Your Own Adventure style but I will read #5 when it comes out to see how everything is resolved. Five book series? That’s a lot, and my hat’s off to anyone who can complete it and do it well. I knew that book 4 was in the works (coming this fall), but I wasn’t aware that book 5 in the works. More to look forward to! I’m a bit worried about book 4 with the Choose Your Own Adventure Style. It will be interesting to see how that works with furthering the overall story. ‘bruised past’…XD Oh dear. I’m glad you liked it! (And realized that it was a five book series too.) ;P Thanks for the review! You have been enticing me to try a kind of book I wouldn’t choose on my own with the reviews of this series. Maybe I will find the time soon. They sure sound fun. Thanks for the post. Haven’t read the other two yet, but I’ll have to get to it, this one sounds fantastic. I also enjoy comic books as well, so the merging of the two has me excited to get reading! I really enjoyed this book! It felt definitely less confusing than the other ones… 🙂 Can’t wait for the next book! I wonder how it’s going to work out. Thanks for your review!